Vanished by E. E. Cooper (bought) - Friendship. Obsession. Deception. Love. When Beth finally reaches out to Kalah in the wake of Brit's suicide, Kalah wants to trust what Beth tells her. But she's swiftly realizing that nothing here is as it seems. Kalah's caught in the middle of a deadly psychological game, and only she can untangle the deceptions and lies to reveal the unthinkable truth. From Goodreads. Trigger Warning: This book features a panic attack, discussion of suicide, and ableist language. 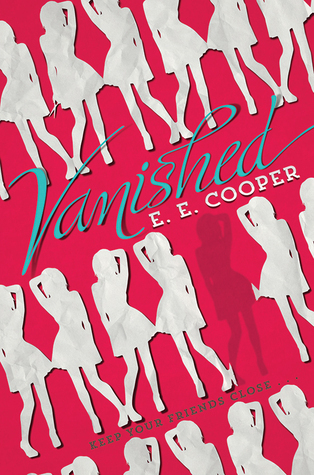 I've really got into mysteries lately, and Vanished by E. E. Cooper sounded awesome. But it was so predictable and a real let down. Kalah was surprised when popular girls Beth and Britney from the year above invited Kalah into their circle months ago, but the girls have grown close ever since. So close that Kalah is starting to fall for Beth, and the two are having secret trysts, despite Kalah having a boyfriend, and despite Kalah knowing Beth has a reputation for breaking hearts. But Kalah believes Beth feels the same way. So it's a huge surprise to her when Beth disappears on her 18th birthday, without saying anything. Even Britney has no clue where she is, but she's not worried; this is just like Beth, and she always talked about getting away. But when rumours start spreading that Beth was secretly in a relationship with Britney's boyfriend, Beth takes it hard, especially when her boyfriend confirms it. Unable to deal with the betrayal, Britney dies by suicide. Kalah is left to deal with the loss of her two best friends, and the girl she was falling in love with. Beth gets in touch in the wake of Britney's death, but Kalah isn't sure she can trust what she's saying. Nothing is as it seems, and only Kalah can work out why Beth really left. My main issue with Vanished is that is was very, very obvious from early on exactly what was happening. I didn't know the how or why, but it was quite clear what was going on as soon as things started happening. It was just so obvious, I don't know how this book can be called a mystery - there was nothing mysterious about it. Even if there was, it was definitely not a thriller. The description calling it a "deadly psychological game" is really overstating it. There was never any time in which I genuinely felt that Kalah was in any danger whatsoever. It was just Kalah trying to work out what was going on, when it was clearly staring her in the face. Vanished does get points for diversity. Kalah is biracial - half-Indian-American, half-white-American, she has OCD and anxiety, and she's bisexual, although the word is never used. The way Vanished dealt with her sexuality was pretty awesome; the confusion she felt when she had never been interested in girls before Beth, how she didn't really know what to do because she also loved her boyfriend, Zach, but she couldn't resist Beth and how she made her feel. The guilt of what she was doing to Zach was eating at her, but she didn't know what to do, she couldn't choose between them. The only thing about it that I wasn't so keen on was how young and naive Kalah seemed, believing things about her relationship with Beth based on no evidence. I don't know whether Beth really liked her or not, the conversation is never had, but Kalah believes she does. Then she doubts herself when Beth disappears - did I do something wrong? Why didn't she tell me? Say goodbye? And when she hears the rumours about Beth and Brit's boyfriend, she's absolutely devastated and doesn't understand. She just seems to see Beth through rose-tinted glasses, and is really knocked down when it looks like things weren't as serious for Beth as she thought they were. She's 17, but the whole way she viewed Beth made her feel more like she was a love-struck 14-year-old. It's not necessarily bad, it's just that it was based on very little. And it felt frustrating. I liked that Kalah had mental illnesses, but the book wasn't about mental illness. Kalah isn't doing as bad as she did in the past, but Beth's disappearance and Brit's suicide have triggered things. Her OCD mostly takes the form of tapping six times, and she'll catch herself doing it without consciously thinking about it. She's able to keep her anxiety at bay for a lot of the time, but there is one point where she does have a panic attack. She thinks someone has been in her room; her things aren't exactly where she left them; they're a little out of place. It's not clear if how Kalah has her things in a very specific place at certain angles is part of her OCD or if she's just quite organised, and likes the way things look together when set out in a certain way. Is her panic attack just about the fact she fears someone has been in her room, going through her stuff, and trying to leave her a message as she believes, or is it also down to the fact that her things are out of place? I'm not quite sure. But how her panic attack was written was spot on, and was dealt with really well. There was one thing I did have an issue with, though, and that was how she was treated because she has mental illnesses. Mysteries have a trope where the main character has a theory about what's going on because of XYZ has happened, but when they go to the appropriate authority figures with their theory, and explain it's because of XYZ, they're not believed, and their theory dismissed, even though both the main character and the readers know they're right. I don't really have a problem with this trope, it can be annoying to have adults not listen to teens, but if they did, the story would end pretty abruptly. However, what I don't like about how this trope is used in Vanished is the reason Kalah isn't believed by her parents or the police is because she has mental illnesses. They have the attitude of, "The poor girl has made it up in her head because she's crazy, let's take her to see a doctor again." For her parents, this is based on past experience. Throughout the novel, it's alluded to that something happened at a previous school that led to Kalah being taken out of the school and transferred to her current school, and it's never said why. It's not a major reveal or anything, but I won't say anything because of spoilers. But it's pretty much the same situation; Kalah told her parents something, and they didn't believe her. There are reasons why they didn't believe her, but still. And so now they think she's going crazy again and making things up. They never say the word "crazy", but it's quite obvious that's what they think. "Never mind her, officer, she's just crazy," is how it comes across. That is not ok. She has OCD and anxiety, not delusions. Ok, sure, she is known to think about the worst case scenario, and her brother does imply at one point that she be a little dramatic in how she thinks, mentioning if she were to hear hooves, she'd think they were zebras rather than horses. But she's not a drama queen who's over the top dramatic. There's no real reason for them to believe she's making things up, that her mental illnesses would lead to delusions, but that's what they seem to think anyway, and it's so harmful and hurtful. She is silenced because she has mental illnesses, and that is far from ok. There's something else I also had quite a big problem with, but it's a massive spoiler, so don't click the button if you don't want to have Vanished spoilt for you. I know the story would be completely different if Britney hadn't faked her own suicide, but what the hell?! Ok, mental illness isn't the focus of this story, but the main character has mental illnesses, so you would expect mental illness and suicide to be taken bloody seriously. I don't know if we're meant to put this down as Britney being just cold and devious and a terrible human being, or if the fault lies with the author and she screwed up here. It made me so mad from the offset, when I knew she faked her suicide - because it was so damn obvious - and I was reading this book enraged. It didn't have to be a fake suicide. It could have been a fake accidental death, that would have worked and been plausible; in her anger and sorrow over being betrayed, Britney wasn't being careful enough, and accidentally fell off the cliff into the sea. I'm sure Cooper could have worked out a way for Britney to do that. Or even a fake murder. I could see how that could be believed, again, Cooper would just have to work out a way for Britney to make it look like a fake murder. But a fake suicide? Suicide is so serious, and not something to be taken lightly. It's absolutely devastating. So to have a book with a fake suicide just feels really bloody wrong to me. Vanished also used ableist language. When thinking about someone's dancing, Kalah uses of the word "spastic" (p205). As it's in the narration, her thoughts, and not said out loud, it's never challenged. This book was published in 2015, not all that long ago, really, so I can't understand how Cooper doesn't realise that it's not ok to use such language. Nor how it got past the editor. It's just not ok. There are very few positives about Vanished for me. A huge let down that was predictable and obvious. I really doubt I'll read the second book in this duology, Avenged. However, do read some other reviews before deciding if you'll read Vanished or not. E. E. Cooper's Website - which redirects to Eileen Cook's website.